I’m a tea freak, much to my dental hygienist’s chagrin. She says it stains my teeth. But I figure that’s what god gave us whitening strips for, right? Celestial Seasonings: Peppermint, Country Peach Passion, Wild Berry Zinger, Sugar Cookie Sleigh Ride, Candy Cane Lane, Green Tea (I buy it in bulk and keep in a glass jar). Trader Joe’s: Chamomile, Pomegranate White Tea, Irish Breakfast, Bedtime Tea (a mixture of peppermint and chamomile), Raspberry Infusion, Blackberry Infusion. I bought the Tazo Wild Sweet Orange after spending copious amounts of money buying it by the (venti) cup at Starbucks. It’s strong, very strong, and works well iced. So do many of the teas in my cupboard, particularly the fruit kind. I steep four bags of flavored tea with four bags of green tea in eight cups of boiling water for 10-20 minutes (sometimes longer), remove the bags, allow to cool and then put it in a glass container in the refrigerator. The lady at S’bux never steers me wrong (she turned me on to the shamefully good cinnamon dolce latte and wild sweet orange tea), so I bought a tall rooibos (she pronounced it “roy bows”) to go. I wish, however, that I’d sat down and drank it like a sane person rather than take it on my hour-long drive from P’burgh to home. There are no cup holders in the Jeep, so I tucked the cup precariously between my purse and a bag of Old Navy t-shirts. After 10 minutes, I was far enough out of the city and away from most of the traffic that I could put the Jeep in cruise and carefully lift the lid on the tea. Of course being S’bux, the tea was still a million degrees, but I wanted to get the tea bag out. With one eye on the road and the other on the cup, I yanked out the tea bag and threw it on the floor. Let’s just say there’re still remnants of “velvety foam” on the gears, seats and floor. But it was worth the struggle and the wait for it to cool down. The vanilla is not overpowering and the milk simply adds texture, not flavor, which is good since I hate the taste of skim milk. A tall, non-fat latte is 2 WW Points and has 120 calories, no fat, 24 grams of carbs (a little high, I assume because of the syrup), 75 mgs sodium, and 20 percent RDA of calcium. It’s not an everyday treat, but that’s what makes it so special. So let me have it, folks. What are your favorite teas? Some of you may suggest I try loose-leaf teas, and I plan to as soon as I find a good tea shop. (Any online suggestions since I live in Podunkville?) Also, how do you “take” your tea? I sweeten mine with stevia or take it straight up, but am I missing something by not adding milk or cream to certain teas? I’m off to finish my cup of Earl Grey. I was in a bitter mood today. Wait, that didn’t come out right. I’m in a splendid mood, but I was in the mood for a bitter tea this morning, thus the Earl Grey. Hot. Just like Captain Picard. This entry was posted in Uncategorized on March 13, 2009 by Lynn Haraldson. omg! I am a tea freak too! I actually have pictures of my tea stash on my computer for a blog post about it! I swear I have at least 60 different teas… yikes.If you like rooibos you should try one I have been drinking for a long time: Celestial Seasonings Madagascar Vanilla Red Rooibos. It comes in a red box with a lion on the front. Fantastic! p.s. I use agave nactar if I need a tea sweetener and on occasion add some skim milk. I do love tea too! Celestial Seasonings Bengal Spice caffeine free is very good. I seldom add sugar or milk to my tea and this one is very good on its own. Lynn P.
I don’t remember the brand – White tea with tangerine. It makes a great iced tea! And English or Irish breakfast tea with milk or Lady Gray tea with milk or lemon. I love my coffee, but switch to tea once I get to work. I've always loved tea. My very favorite is Good Earth Original. It's strong & spicy & orangey, and it tastes sweet without sweetener. They make a regular and a decaf (with your rooibos!) variety. Their vanilla white decaf is also nice, although not as strongly spiced. I also like just about any brand of mint tea. (I'm lucky at my workplace, they buy a lot of varieties of herbal and regular tea, so I've gotten to try a lot of teas without having to buy the whole box. My best recent find in the break room is the Stash pomegranate raspberry green tea with matcha. )I don't always sweeten my tea, but these days I use stevia or splenda or sometimes a drop of honey. If it's black tea, I like a little lemon in it. Thanks Lynn, I love reading about everyone’s teas. I am a tea person but I like mine with milk so I will definitely try all the ones you mentioned that you put milk in. Most of the time I’m just a lipton and milk girl. I make mine in my coffee pot and it comes out perfect every time. It’s a great way to not eat the house at night lol. Ironically, I used to be a tea freak, too, until I moved to England. Now I never touch the stuff. I like decaf coffee and a barley drink called Caro. Go figure! 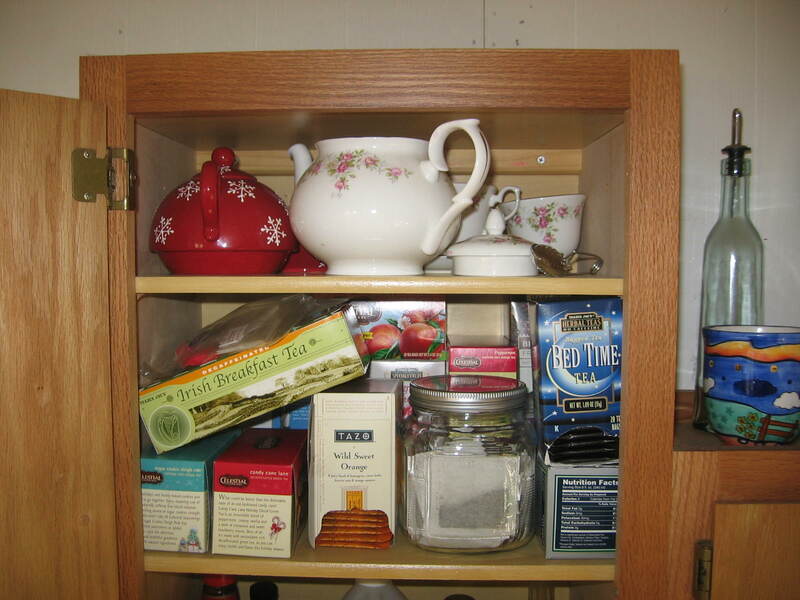 When I lived in America, my cupboard looked like yours, plus I had a huge collection of teapots and cups and saucers! Now we drink from grubby mugs–like every other English person I know. Oh well! Yah, I’m with PUBSGAL–Good Earth Original. Which makes me wonder if it is a California only tea? YEA – Captain Picard. yes, we (3 out of the 5 of us) are star trek people. Youngest and I just went back and watched the original series (she had never seen it – I had not seen it since I was a child). New movie comes out in MAY! Once again, parallel lives. A third of my pantry is devoted to my tea stash (which includes Stash Tea, chai flavor). After the nice people at Teavalize sent me some of their stuff, I got hooked on loose-leaf tea. It’s so much better than the dusty stuff in tea bags. Teavalize is too expensive, so I’ve been using up the stuff in my pantry. I like the teas from Rishi, which I get at Whole Foods. If you live near a Teavana store, that’s a super fun place to visit if you’re a tea fan. Their teas tend to be pricey, too, but excellent. I found some awesome stuff at TJ Maxx of all places — Gypsy Tea Strawberry Osmanthus. It comes in these giant tea sachets that you use to make iced tea. Also, anything by Revolution tea. Once the temperature gets above 80 degrees, I love drinking sun tea, which is steeped in water that heats outdoors for several hours. The result isn’t as flat as tea made from hot, boiled water. I use a few bags of Luzianne and a single bag of orange-flavored tea just to spice things up.~Shelley S.
I love both coffee and tea.I buy loose leaf tea locally herehttp://www.sensibiliteasonline.com/index.html – but they ship. Super knowledgeable about tea and have fresh stuff.I love Earl Grey, and I love mandarin orange tea. I am also a huge chai fan or tea with ginger in it. Best loose tea in THE WORLD: Teavana.com I recommend all of the fruit herbals, especially the peach tranquility. Their single server teamaker is awesome too. I like Yogi Tea. They have some nice green and white tea blends, and their peach detox is a nice gentle diuretic. I am also a fan of the rooibus, yum! Lyn – This is my all time favorite:http://www.teavana.com/The-Teas/Herbal-Teas/Caribbean-Breeze-Herbal-Tea.axdTry it – It is excellent hot and cold. It does taste like a caribbean breeze.PS – Amazing job on weight loss and more important maintenance. You are an inspiration to all.